As we fast approach my most favorite holiday, Thanksgiving, I am also quite mindful that Christmas is coming just as fast. You'll find me humming christmas songs as I prepare this week. Did you ever wonder why there are no "songs" we really sing for thanksgiving ? It seems to me that there should be. I just plain love this particular day. .. yeah, before you all write and chastise me, I know there's 'we gather together'.. but that song always feels more like church to me, and not so much thanksgiving... but I digress. Perhaps the thing I love most about this day is that nothing is expected of anyone, except to show up, eat and enjoy each other, while giving thanks for all our many blessings. That's just about perfect in my book. I have been cleaning like the energizer bunny, and the house is ready for company. I even washed the windows. It looks glorious, and I am well pleased. Now all that needs to be done is to enjoy my family - that is truly the best part of this holiday. 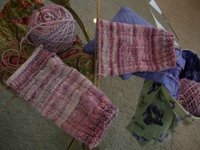 Between dyeing new batches of fiber, and sending out packages (that's K's job) I've been doing a bit of knitting - hurrah! Here's some completed Christmas gifts :-) and definately no hints as to who they are for! You never know who might peek into blogland! this is a pattern written by Heartstrings. It has hearts all around the ankle and top of the foot, and it definately fits this recipient (whom I dearly love) I'd model them to show you the hearts, but they're already washed and ready to go. You'll just have to imagine. these are in progress. I've begun the heel on one sock, and am about 1/2 inch from the top of the heel on the second. Please forgive the color being "off" in this photo - they are much lighter than they appear here. for accurate color, look here. The pattern I am using for these is the Madder Rib, from Nancy Bush. and yes, there is already a pair of these! I made them a bit longer than normal, since the recipient has elegant long fingers (longer than mine *grin*) and I think that she'll enjoy them. I have to hide them from my cats until they are wrapped. The cats seem to love all things goat - they continue to steal them, and prance all around the house with the glove in their mouth, like they have stalked some kind of prey. very silly. I am using some silk-merino by Louisa Harding to knit these. Can everyone say oooooooh-aaaaahh... yes, they feel like heaven. I will edge them around the cuff and the top with the multicolor green mohair-silk just to add a tiny touch of 'bling'. The recipient of these is certainly special enough to me to merit this divine yarn. I am knitting with another cable design - which I am totally enjoying - this is one that I modified from a sweater pattern in the Viking Knits book that is also pictured. The gloves are so satisfying to knit. They only take a couple of days, and there is no worry about whether or not I know what size someone's foot is. this is good. Happy thanksgiving to all of you - may you be blessed throughout the holiday season. Your holiday knitting looks beaoooootiful! 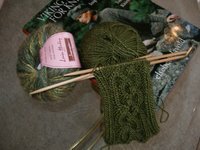 The green fingerless gloves will be especially pretty trimmed with the mohair. May I ask what size needles you prefer for your sock hop socks? Your knitting looks beautiful. Have a wonderful Thanksgiving, too! I just got a Christmas knitting assignment. 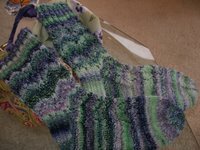 My MIL loves her Broadripples as bed socks and would love another pair of handknits. Happy Thanksgiving, Teyani! I hope you have a wonderful day! The knits look quite nice...they are coming out very well! !Happy Thanks Giving To You and your Family!! So many beautiful knits. You've got some lucky people on your holiday list! I still have so much to do and Christmas seems to be coming really fast this year hopefully I'll be able to get it all done! Thanksgiving is my favorite holiday, too, for all the same reasons as you. And I love those fingerless gloves, cables and all! Aha. I'm glad you got to keep some of that sock yarn for yourself. 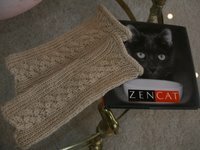 Well... to knit with... And isn't that merino silk lovely? I love that green and the chocolate brown. Yum. Happy Turkey Day to you and yours. I am behind with my Christmas knitting. I am trying to scramble and finish my Icarus in time for the holiday parties this year so I am behind with everything else. Blessings to you and your family. Your knits are beautiful and inspirating. I especially love those gorgeous cables. All of your holiday knitting is simply gorgeous. Have a happy and healthy Thanksgiving! I'm in love with those green fingerless gloves! I think you need to write up a pattern. Happy Thanksgiving! I only have a few things to knit, a hat and a pair of socks, so hopefully I'll be done on time! Lovely holidays to you, too, Teyani! I must admit to being a big fan of Thanksgiving myself... it's the only time of year that my mother's incredible cranberry sauce shows up. I do love seeing your different colorways knit up. 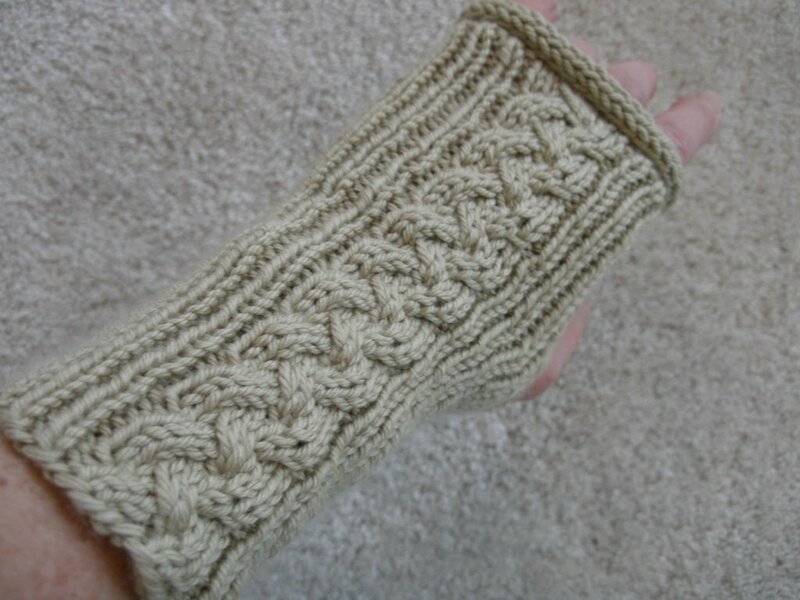 And I've been thinking about fingerless mitts a lot lately since it seems like they might be a nice use for the Sloopy I'll have left over after I finish my socks. Happy Thanksgiving to you too! I hope you have a wonderful one. And your Christmas knitting is looking great btw. Not much Christmas knitting happening here but I am counting my blessings with every knit stitch. May you and yours have a fabulous Holiday! Perhaps a new colorway celebrating your Energizer Bunny-ness. Awesome amount of knitting - even whole pairs! Happy Thanksgiving! Being Canadian, I'm a passive observer to this holiday (our Thanksgiving was in October) I really enjoy this holiday because it is at my house and all the laws and in-laws, and anyone else comes to MY HOUSE! No struggles. No guilt. Just lots off food and wine, laughter and love. Everyone is happy (except the turkey, poor guy)! Enjoy your holiday. I'm making one present (or going to try), a knitted stuffed kitty for my sister. I wish I could knit more gifts, but with a full-time job, it's really hard. 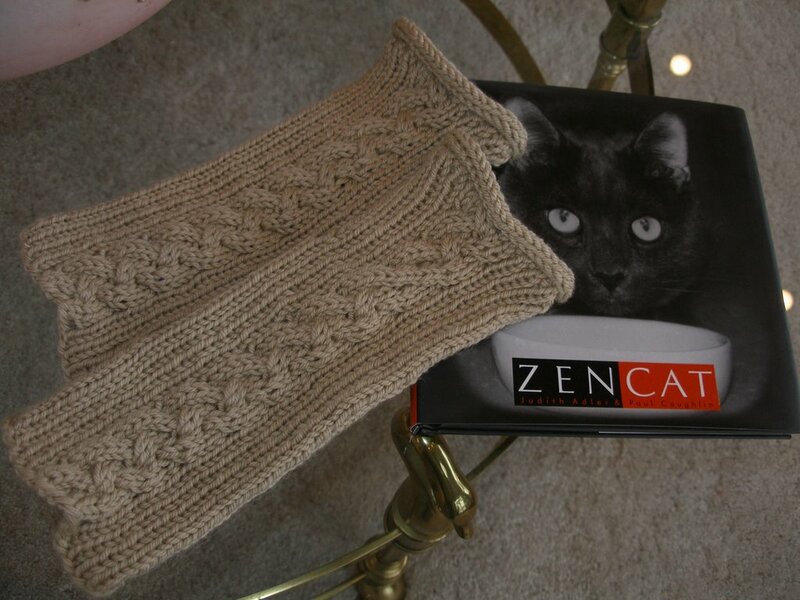 Your knitted gifts are gorgeous -- I know I'd be thrilled to get those lovely hand/armwarmers. Your gifts look as beautiful as always - and the recipients will be thrilled! I hope your Thanskgiving is full of family and good food and cheer. no christmas knitting here. life has been just too busy! your knits look lovely as always! enjoy your thanksgiving and time with your family!!! Lovely wristlets! We, too, cleaned and cleaned and cleaned, then cooked and cooked and cooked some more. That silky stuff is beautiful. I'm so impressed with how far along you are on your holiday knitting. I've only managed one measly little roll-brim hat. And for Thanksgiving tunes, perhaps you could belt out a few choruses of "Alice's Restaurant." The whole thing gets a bit talky and wordy and goes on and on (! ), but when the chorus comes around again, act like you're a movement! 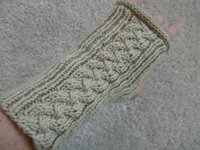 Any chance you could share where the pattern is for the cabled fingerless gloves? They are so beautiful! Just checking up on some of your old blogs, and lo and behold, I do believe I recognize a beautiful pair of green fingerless gloves!! I love them ... and I love you, too! !